Henry Dingle Cockburn was born about 1814. He was the fourth son of General James Cockburn and his wife Johanna of Woolwich, Kent, England. In 1853, a daughter Annie J was born to Henry D and Mary A Cockburn at Hunters Hill, NSW. He died at Concord NSW on 26 June 1873, aged 59. His widow erected a large monument for him at the old Church of England Cemetery at Rookwood. Mary Cockburn, daughter of James and Mary, died at Waterloo, NSW, in 1880. By 1859 Henry D Cockburn and Henry Israel were advertising as auctioneers on the corner of Pitt and Park streets. Henry Cockburn was living at 80 Abercrombie Street. 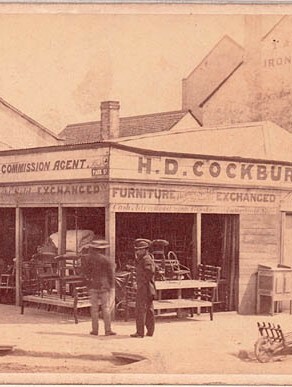 After Henry Israel’s death in 1865, Cockburn, auctioneer and commission agent became the sole proprietor and expanded the furniture shop and auction rooms with premises at 296 and 347 Pitt Street. He had his private residence at 39 Cumberland Street but moved to Glebe Road in 1869 and Newtown Road in 1873. Henry Cockburn was a Councillor from 1 November 1852 until 31 December 1853 when the Council was replaced by City Commissioners.